I love exploring the versatility of grains. This recipe was originally with Farro, some grain that I haven't seen in Dubai. Instead, I decided to use naked barley. I find barley a very mild grain. My son used to love it as his baby cereal when he was about one year old. The combination with green beans and corn also stems from the original recipe and works really well. I added some roasted chicken, which makes the feta cheese optional. Or the other way around: ignore the chicken and sprinkle feta cheese on top. What really makes this salad a sensation, is the mustard dressing that goes particularly well with the chicken. It's light, it's colorful, it's absolutely delicious. In fact, I had this salad for 3 or 4 days in a row for either lunch or dinner because I couldn't get enough of my new salad discovery. Cook barley in boiling salted water until just tender, about 75-90 minutes or until chewy. Drain and let cool. Sprinkle chicken with salt and pepper and dried herbs. Place on a tray and grill in the oven at full heat until golden brown, then turn and grill the other side, about 8 minutes each side. Let the chicken cool, then cut into 1-2cm cubes. Steam green beans and corn or cook in large saucepan of boiling salted water until crisp-tender, about 4 minutes. If cooked in water, drain. 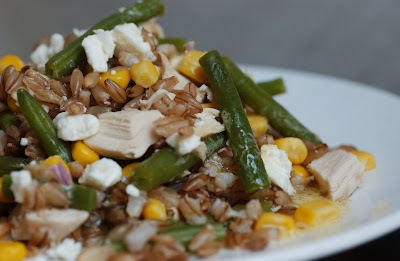 Mix barley, chicken, green beans and corn in large bowl; then add green onions. Combine the oil, marjoram, and salt in small bowl. Whisk in vinegar, shallot, and mustard. Pour over salad in bowl; toss to coat. Season to taste with salt and pepper. Sprinkle with goats cheese or regular feta cheese before serving.